Need a last-minute kerstboom (Christmas tree)? The annual Christmas tree market at Janskerkhof has you covered. From the usual larger ones all the way down to small potted plants, you can find a lovely selection of “trees”. With some bonus Bacchus for this festive season. By the Mariaplaats, on the western side of town, not far from the train station, is the Pandhof Sinte Marie, or St. Mary’s Courtyard. 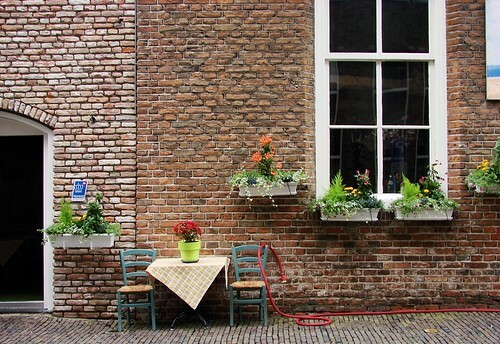 It’s part of the remnants of a covered walkway and monastery garden that was part of the Mariakerk (church) that once stood in the area. The sunken garden is a beautiful, peaceful oasis in the city, much like the courtyard next to the cathedral. It’s one of those places to simply go and relax and ponder life. The last time I was there, I was pondering the colonnade (the covered walkway) that runs along two sides of the garden area. The Romanesque style colonnade — and colonnades in general — will be taking on greater meaning in my life in the future. 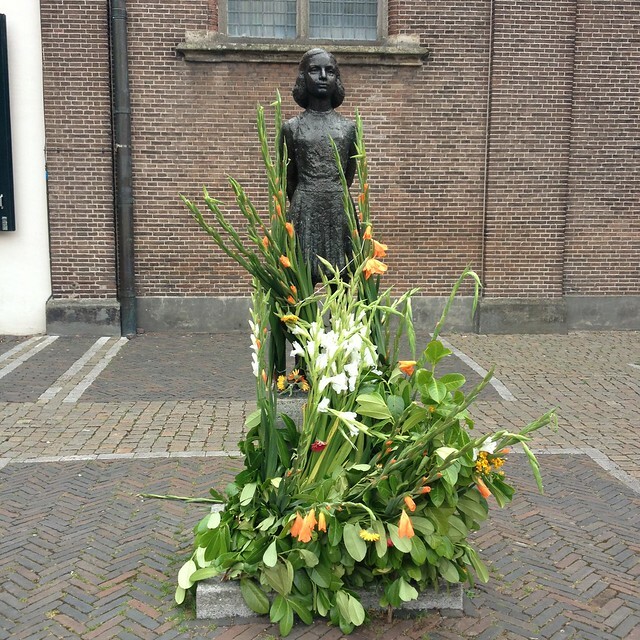 As is so often the case on Sunday mornings, the day after the large flower market in Janskerkhof, the statue of Anne Frank is awash with flowers placed in remembrance. This particular Sunday saw an extra large display. All on one short section of a street. Cities around the world have been remembering those who were murdered at the Pulse nightclub in Orlando last week. While it is heart-warming to see the outpouring of support and love, it is heartbreaking that atrocities like these continue. I was born in Orlando and lived there for the first 16 years of my life and while it has been a long time since I lived there, it will always be home. Having something so hateful and violent happen in my hometown makes it that little more personal, though I have LGBT friends who have sadly been the victims of violence on a much smaller but more frequent scale in a variety of cities. 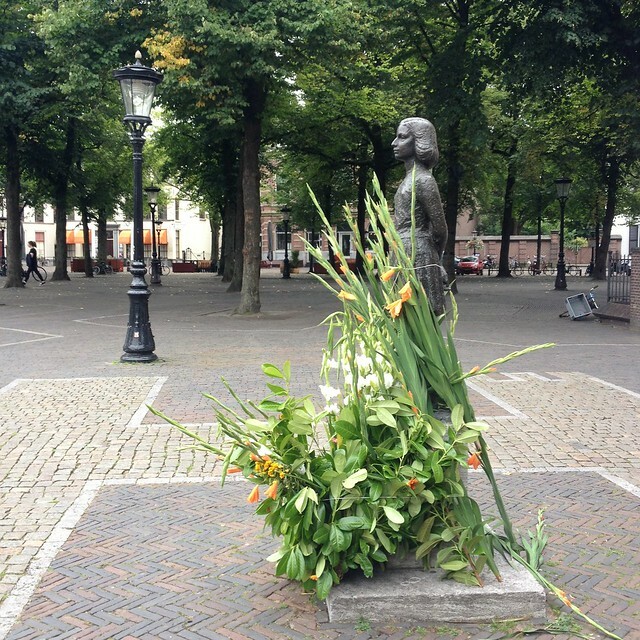 Back in 2012, I wrote about the gay rights memorial here in Utrecht on the Domplein. At that point, gay marriage hadn’t been legalized in the US. In fact, one of the other states I used to live in was trying to make it very specifically illegal. Fortunately, that was something of a last gasp in the fight against marriage equality for all and gay marriage is now legal in all 50 states. Of course, the rights of transgendered people have since become the new battle. One step forward, two steps back is how it sometimes feels. Yet for all the ugliness, there have certainly been large steps forward overall. Pride parades continue to grow and more people stand in support of equal rights for all. 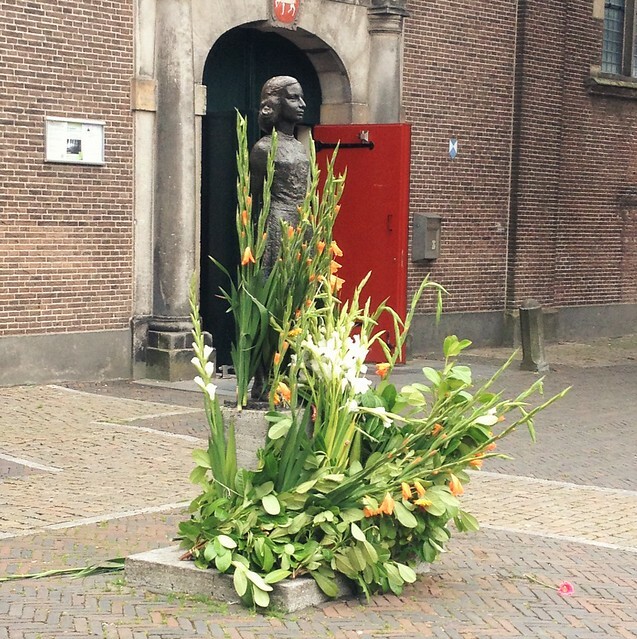 Utrecht has an annual Midzomergracht Festival, in its 20th year, celebrating sexuality and gender diversity. At its start on Friday, it included a remembrance at the memorial in honor of those who died in Orlando. 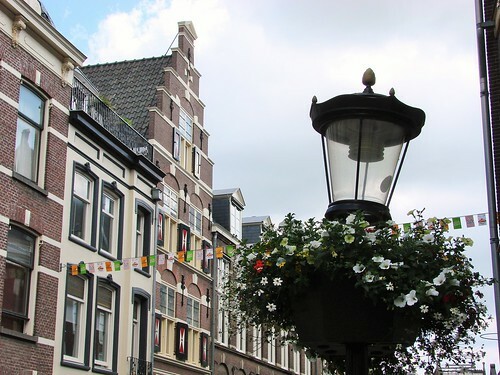 Early Saturday morning, while Charlie and I were out walking, we ended up at the Domplein. The street sweeping machine was out cleaning up the square, but the flowers, cards, figurines, and candles remained atop the memorial. Many of the candles were still burning. It was a sobering, yet touching display. It is awful that so many innocent lives were taken, but it is heartening that they are being remembered and honored around the world. We’re reaching peak autumnal coloring right about now, it seems. On my morning walks with Charlie these past couple of days, with the sun shining and the sky a lovely blue, all the yellows, oranges, and reds of the changing leaves have been pretty spectacular. 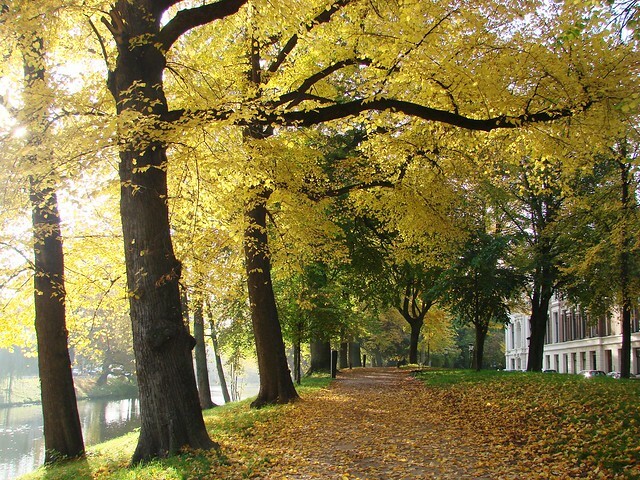 There’s a lot of yellow around town, and as in this first photo, it really glows when the sunlight hits the leaves. 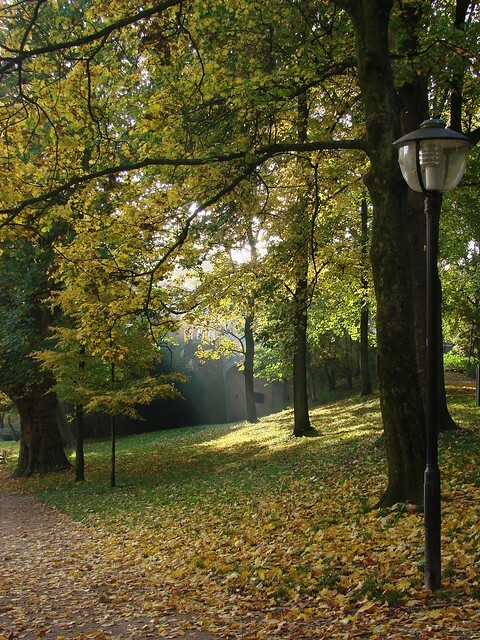 That sunlight also creates some beautiful spotlights as the rays burst through the trees, as it did this morning in a little spot by the Sonnenborgh. The trees also create wonderful pops of color against the austere brick architecture. This building, in particular, seems made for this time of year, though perhaps better suited to the darkness and fog. I always think it looks like something out of a classic horror film. Love it! 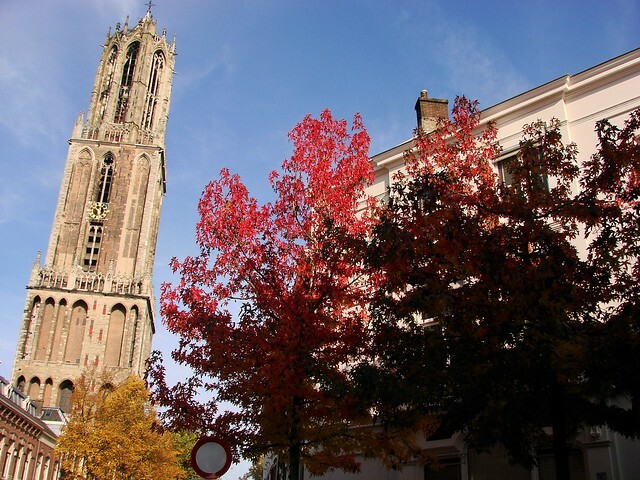 As we approached the Domplein, the Domtoren was glowing brightly, almost bleached by the sun, but this red tree at the Trans was particularly spectacular, with the mix of colors and the bright red against the blue sky. 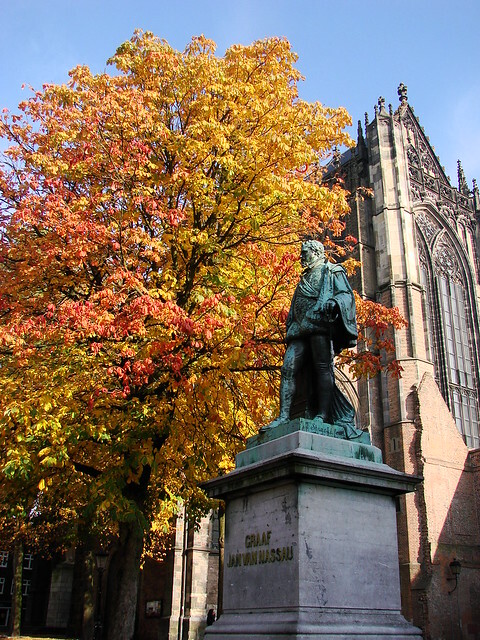 And finally, in the Domplein, Jan van Nassau has a stunning backdrop of changing leaves and unchanging Gothic architecture. 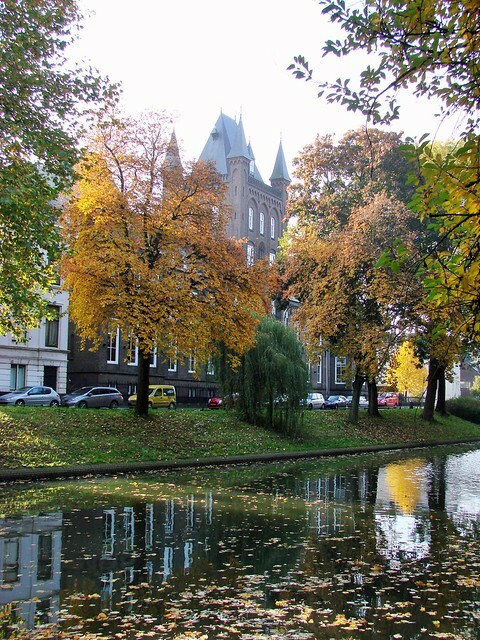 Utrecht was looking pretty fantastic this morning. 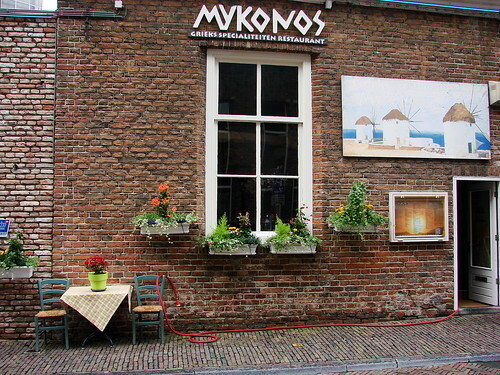 Mykonos, besides being a Greek island, is a restaurant here in Utrecht just off of Neude. When I passed by the other weekend during the Tour de France Grand Depart events, I couldn’t help but notice a certain French bistro touch to the outside that I don’t remember. Or maybe I’ve just been oblivious. Either way, it’s pretty and charming. 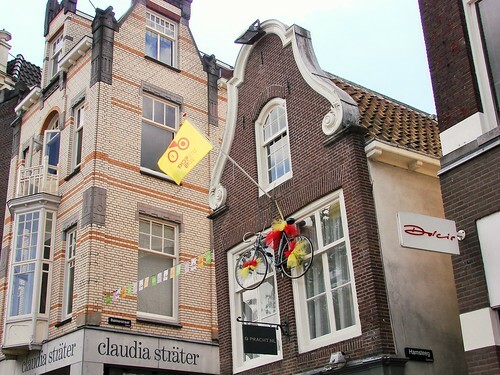 This adorable, at-an-angle building on the Oudegracht is often decorated for various festive events, such as Queen’s Day/King’s Day. Therefore, it’s no surprise that they’ve gotten into the Tour de France spirit. The flag is a common one you’ll see around town. We even have one hanging outside Vino Veritas. But the bike? That’s all them! It’s the rare street that doesn’t have some sort of decoration. 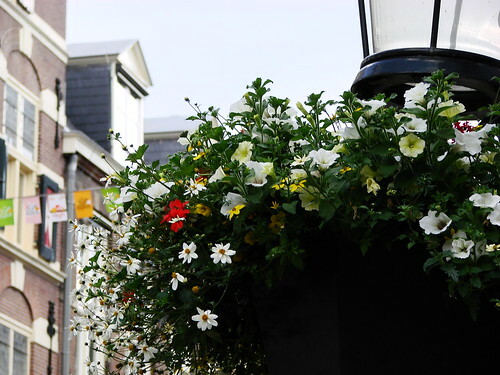 As well as the flags, there are the pennants that criss-cross the streets, the occasional yellow carpet at restaurant entrances, and of course, even the flowers that decorate the lamp posts are continuing the theme. The flowers are there every year, but it’s the color that has changed. Usually they’re some combination of red, pink, and purple and always pretty. This year, if you look closely, you’ll realize they are also in the Tour de France color scheme, featuring the ubiquitous yellow, as well as the white and red, and the green of some of the other jerseys. Of course, with the heat wave we’re having, the flowers are at risk of looking a bit limp. 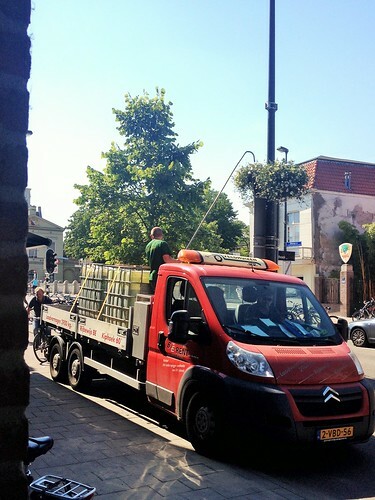 They need to stay hydrated just as we do, so they’re sending watering trucks out to feed the plants. We saw one yesterday at work. Hopefully we’ll all survive the hot temperatures of the coming days!